On the magic of Paris: Before living in New York City [my favorite place I’d ever been] was definitely NY but this summer I went to Paris and it was everything I had imagined and more. There are few cities that I’ve visited where the idea matches the result. If that makes sense? I took a couple years of French in school and I just remember learning so much about it and thinking “my lord I hope I’m not disappointed when i get there and my dreams are shattered.” As corny as it sounds when I saw the Eiffel Tower i needed a second to take it all in and just enjoy the moment. It’s the one place i’d always wanted to visit and it certainly didn’t disappoint. Also THE BREAD!! On coming out: My coming out I felt happened over the course of a couple years. I think I was around 14 when I told my mom that “kids at school were calling me gay and I think they’re right”. I kind of didn’t take ownership of it because I was still learning who I was but I knew under the surface that this is what I wanted to say. I was always a kid that didn’t want to disappoint people so coming out took years for me to get up the courage and finally say NOPE this is me and like it or leave it. My parents were supportive but also not convinced. I don’t think they understood anything about queer people because we were never surrounded by it & we also grew up in a very conservative home. The road and conversations were certainly not easy but we’ve come to a great place since then. On a brilliant self-discovery: As I said I was always a people pleaser growing up so I learned throughout my self discovery that being what others wanted would never truly validate me or my experience. I think that’s why coming out took a while. It happened early on so bullying was a big thing and learning to stand my ground was huge. I learned that I was a lot stronger that I was allowing myself to be before that. On his advice to those who are hesitant to come out: I’d say that safety comes first. If you feel physically or emotionally unsafe in coming out then I would seek out some assistance from outside sources to possibly lessen the potential blow. Every kid knows their family’s parameters of acceptance to a certain extent. If things feel scary but safe I’d say to come up with a plan and really own that space. One thing I regret was instead of saying “the kids say I’m...” I wish I would’ve said I AM GAY. Alas everyone’s journey is different. I will say a lot of the fear I had about family and friends was silly because most of them had already understood who I was before I did. You’d be really shocked who doesn’t seem like they’d be in your corner and then they show up full force. On promoting body positivity & being there for yourself: I remember the first time a guy I liked told me I was fat. It’s burned into my memory and I wasn’t the same after that. I’ve heard many things since then. I remember mostly trying to mold myself to the attraction of other men rather than mold their attraction to me. I think that was the big shift for me. My body has fluctuated so much over the years that it wasn’t because I lost weight or started working out that men were attracted to me. I’ve always had boyfriends etc. It just so happened that when I started owning the space around me and knowing that my body was only one part of me and that it should never dictate my worth, that’s I started attracting men that were RIGHT for me. Many times we attract the wrong people using the wrong assets of our existence. It doesn’t matter my size or look because there will always be someone there as long as I’m there for myself first. On facing fear head-on: I remember when I first started putting on wigs and lipstick for my characters I was so afraid that I’d be undesirable to men and potential acting opportunities. It turns out I was wrong on both. I limited myself because of age old “don’t be femme” fear. Told year after year that femme men aren’t loved by society you start to believe the nonsense. Then I had a moment where I remember thinking “honestly I just want to create and if people don’t like this, then they don’t like me.” Because my creativity is such a huge part of who I am that I could never deny that for the sake of acceptance. Luckily I learned that stepping into that confidence was my ticket to unlocking many dreams I’d imagine possible but never felt could happen. On the key to a successful relationship: This is the first relationship I’ve ever had that has been so easy. I’ve heard that from so many couples but never understood it. We’re taught that love is supposed to be hard and painful but I think that’s a bunch of crap! Haha. Our communication is something I’ve always enjoyed and our openness never to judge the other for their feelings or opinions etc. We’re truly the best of friends. We’re busy but knowing that and understanding and little things like “sorry baby I’m in this meeting” go such a long way. Communication is so important with intimacy and I feel that when you work on that you can be unstoppable. We also always say “our relationship, our rules”. We’re a team and we know that through and through. 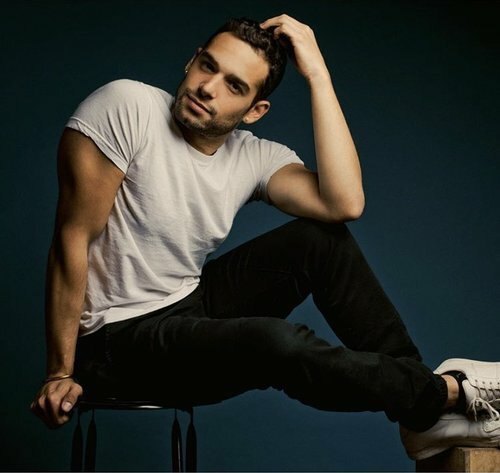 On starring in one of the biggest TV shows of 2018 (Pose on FX): I remember when they announced this show was being made I emailed my agent right away and said “I don’t care what part or how but I need to be involved.” As a queer Latinx person there aren’t tons of opportunities to play a representation of who your are and where you come from so this was a dream. Playing the role of Costas and having Billy Porter as my scene partner was stuff of my dreams. I’ve always been a dreamer but THIS was a reality. I was in awe the entire way through. Playing this role of a queer man dying of AIDS was so emotional but also so rewarding because we lost so many beautiful creative souls to the epidemic that it felt like such a welcomed responsibility to honor them in any way I could. The show itself has really proven that when you allow people a seat at the table they can truly shine and create magic. That’s for everyone involved in Pose. They’re all magic. On creating hilarious, thoughtful characters: My characters are a conglomeration of people I’ve experienced over the years and are also facets of my own personality. Megan is my crazy. Julissa is my confidence. And Ina is my Brain. Haha I grew up watching John Leguizamo and Eddie Murphy, Martin Lawrence and Jim Carrey. 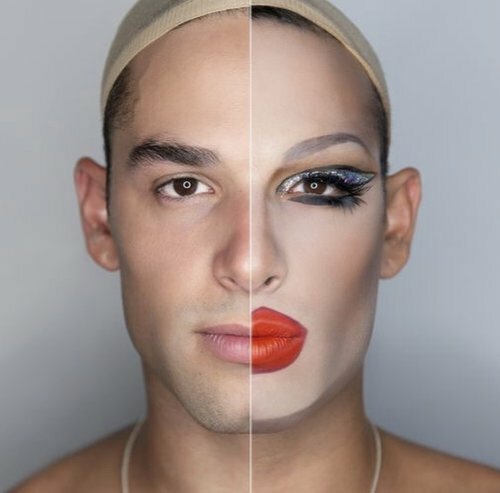 These men transformed themselves into their characters and it made me want to commit to doing the same. I love to watch and listen to people. I always remember crazy circumstances and conversations that I later turn into material for my characters and sketch videos I make.